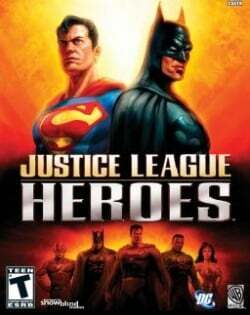 Game description: Justice League Heroes is an action adventure game with role-playing customization featuring Superman, Batman, Green Lantern, The Flash, Wonder Woman, Martian Manhunter, Zatanna and other unlockable Justice League super heroes. Each hero possesses an array of character-specific, upgradeable superpowers resulting in unique controls and fighting-styles. Engaging in one-to-two player cooperative combat, gamers are be able to customize and master these superpowers as they travel through interactive and destructible environments spanning the farthest corners of the universe. Each level consists of two members of the Justice League battling a variety of villains and their henchmen. When the game is being played by a single player, the player can freely switch between both of the two Justice League members and play as whichever one he or she prefers. USA v02.20(10/02/2006), A little heavy in software mode, In Hardware mode only shown correctly half screen,but in software mode no problem, the game work fine,the screen its fine. Description: Displays only half the screen (as shown in screenshot 2) in hardware mode. Workaround: Switching to software mode (F9) is the only known way to fix it. This page was last edited on 10 December 2017, at 07:11.